In a letter, Eastern Province Chief Minister Nazeer Ahamed condemned the decision taken by the tri- forces to boycott events he attended. The CM went on to say the decision made by the forces was political, whose leaders appeared to have joined hands to look at the issue from the limited perspective of protecting the offenders within their ranks and not from the broader prospect of establishing truth and justice. “In any event, the issue has broader implications. It would be in the best interest of the country for the responsible officers to apologise,” the letter read. The CM also said he would not hesitate to express his unequivocal regret and apologies to all those who were present, including the staff and students of the school, the foreign dignitary and the concerned naval officer for his strong but justifiable reaction. Sampur Maha Vidyalaya is a school under the Eastern Provincial Council. It is not a national school. A well- known business organisation in Colombo had volunteered through the Sri Lanka Navy to donate computers and other items to the school. In appreciation of this good gesture, in my capacity as the Chief Minister of the Eastern Province, I attended the function held at the school. The Hon. 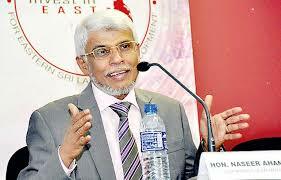 Minister of Education of the Eastern Province Hon. Thandayuthapani also attended the function. The function was organised by the school. As I arrived at the function, the Hon. Governor’s name and the name of HE Atul Keshap, the Ambassador of the USA in Sri Lanka were announced by the compeer who was the English teacher of the school. My name or the name of the Minister of Education of the province was not announced, though both of us had arrived. The Hon. Governor perhaps, noticing the lapse, signaled me to come up to the stage. When I came up on stage, a naval officer who was acting as the ‘master of ceremonies’, physically obstructed me from proceeding to take my place on the stage. It may be due to the fact that he was trying to stop the media personnel getting on to the stage. His grossly offensive conduct, an offence under the Penal Code, shocked me. I censured him, questioning him as to who he was to stop me. I also blamed the Hon. Governor for not directing the officials to follow proper protocol. I felt insulted in the presence of a foreign dignitary and a large public gathering. Though it was clearly a usurpation of the functions of the Eastern Provincial Council and in violation of the country’s Constitution, I attended the function without raising any issue, out of respect to Your Excellencies and the foreign guest in attendance in the province of which I happened to be the Chief Minister. I also understand that the Tri-Forces have today decided to boycott functions attended by me even before Your Excellency the President had looked into the matter. I condemn this as a political decision by the forces whose leaders appear to have joined hands to look at the issue from the limited perspective of protecting the offenders within their ranks and not from the broader prospect of establishing truth and justice. In any event, the issue has broader implications. It would be in the best interest of the country for the responsible officers to apologise. I would not hesitate to express my unequivocal regret and apologies to all those who were present, including the staff and students of the school, the foreign dignitary and the concerned naval officer for my strong but justifiable reaction. I wish to leave any further steps in this regard in the hands of Your Excellencies.